Mysuru: Is there more than what meets the eye to the discontent brewing in Congress over Chief Minister Siddharamaiah contesting both from Chamundeshwari in Mysuru and Badami in Bagalkot District? If Siddharamaiah’s behaviour is taken into consideration, it looks like he is upset with the party High Command for not allowing him to contest from both the constituencies. KPCC President Dr. G. Parameshwara and AICC General Secretary K.C. Venugopal met the CM last evening, at Hotel Southern Star (after Siddharamaiah finished his campaigning in Varuna) and held closed-door meeting with him regarding his contesting from two seats. Sources said that the CM, after the meeting, walked away in a huff without even looking at the reporters who were waiting to speak to him. Today morning too, the CM got angry when reporters questioned him about yesterday’s parleys between him, Venugopal and Parameshwara. Siddharamaiah, who usually steps out of his house at 10 am to hit the campaign trail, did not come out of his house even at 11.30 am though party workers were waiting for him since early morning. As soon as the CM came out of his house, media persons crowded him and posed questions. Siddharamaiah, who came out with a slight grin on his face, got angry when reporters questioned him on his contest from Badami and Chamundeshwari. “Congress High Command will decide on my contesting from Badami,” he said. But not leaving at this, reporters again questioned about the confusion in party ticket distribution in Badami, the CM said “Don’t ask repeat questions.” When reporters persisted, an angry CM said, “We will solve all confusion and it is left to the party. It does not concern you” and boarded his SUV to leave for Varuna campaign. Inside sources from the party told Star of Mysore that Siddharamaiah conveyed a clear message to the High Command that he must be allowed to contest from Badami and Chamundeshwari as there is a coalition of BJP and JD(S) to defeat him in Chamundeshwari. Meeting KPCC Chief and AICC General Secretary yesterday, the CM told them that if denied two seats, he (CM) will not campaign for other party candidates in the State. Yesterday, sitting Badami MLA B.B. Chimmanakatti too had to face Siddharamaiah’s anger. He had come to the hotel where Venugopal, Parameshwara and Siddharamaiah met. Saying this, the CM entered the room where the meeting was to take place and closed the door behind him. However, it is not clear if CM met Chimmanakatti after the meeting. 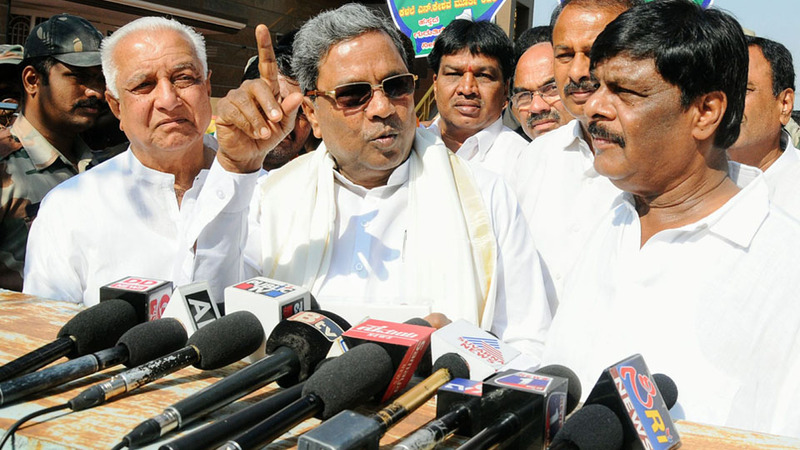 Sources added that Parameshwara and Venugopal left for Bengaluru late in the night after meeting the CM. Ironically Chief Minister Siddaramaiah who was bragging about having given very good governance during the 5 year term is getting jittery about comfortably winning the Chamundeshwari assembly seat and is insisting on contesting from Badami assembly constituency considered safer for his party due to it’s composition.It is an open secret that both Mr.Parameshwara and Mr.Mallukarjuna Kharge are actively trying to scuttle his running for cover and still retain the leadership of the party notwithstanding a shock defeat from the Chamundeshwari seat. high command must not give any ticket to siddu either in badami or in chamundeshwari and throw him out of congress. While it is entertaining Star of Mysore is more of gossip paper than news paper writing opinions (e.g. … it looks like he is upset with the party High Command …) and non news instead of facts. The article is just about assumptions and narrating useless exchange of words which looks like a page from novel ment for entertainment. 200% true. Also very silly and insignificant happenings within the city are highlighted as news. Personally i feel he is not corrupt and has no business to be in congress! But he is not a great leader, but the worst thing us, he has to obey the madam and son and show utmost loyalty and that is why he keeps uttering nonsnce abusing Modi ! Yet, sometimes,his unconscious mind sodas the truth and one of those moments, he told that ‘Congress tells the same lie 100 times to make it the truth, it is the most corrupt party’ later corrected it was about BJP! Newspapers can’t go for a day without accusing Modi for any incident that happens in are more village in this country! India has winessed massacres and riots in the last, even gnocide(anti Sikh riots, killing and driving Kasmiri Pandits , Maharashtra riots for example), emergency yet, fir the last 4 years the protests have reached unimaginable heights even to the extent that opposition lead my mother and Son want to impeach CHief Justice of India! So, mother and son want to be the judge and the jury and run the government!